With any project, it �s the details that make the difference. That is exactly why we have teamed up, again, with Marc Sommerfeld to bring another innovation to the market. The new Sommerfeld Junior Raised Panel System is a version of the original cabinet door set - a smaller scale and enormous possibilities. The Sommerfeld Junior Set lets you make frame and panel details as small as 2-3/4� square and in material as thin as 7/16�, up to 11/16� thick. These delicate looking panels are only the beginning and enhance a variety of projects. Make templates and add interesting arches to your work. But don�t be fooled, they produce extremely strong joints and add integrity to any creations. Jewelry boxes, humidors, clock cases, even library panels and coffered ceilings will come alive with the beauty frame and panel craftsmanship provides. 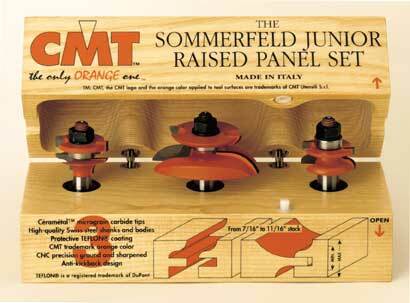 The Sommerfeld Junior Set includes the Raised Panel Bit with back-cutter and the matched Ogee Rail & Stile pair, packaged in a protective hardwood case.